Caley Ocean Systems has designed a new and unique pipe press to increase the potential use of larger pipes in shallow fields. NOV Tuboscope tasked Caley Ocean Systems with creating a pipe press to join X65 carbon steel pipes with a 16 in. diameter and one-inch wall thickness using a mechanical interface – a large step away from traditional welding methods. 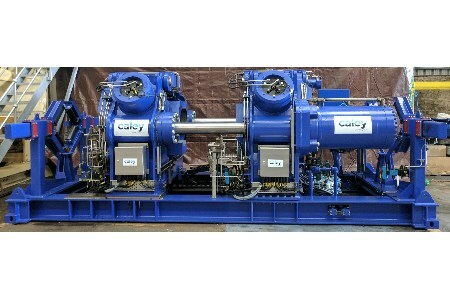 Using Zap-Lok technology, Caley designed, manufactured and tested a press which can form continuous pipe strings for offshore projects. This system is the first of its kind to enable the connection of pipes this size, wall and grade, and reduces pipe joining cycle times by 500%. The press incorporates automated and higher load hydraulic power, data capture systems and improved quality control. The hydraulic press joins pre-shaped pipes which have a pin and socket formed at either end. These pipes can be shaped at site or at a pipe mill using the new press system. Before any joining takes place, the ends are lubricated with an Epoxy resin. The two pipes are then fed axially into the press, where they are joined together by two of Caley’s friction clamps. These clamps house three hydraulic cylinders that together can generate more than 1000 t of squeeze force. They are driven by two hydraulic cylinders which generate up to 900 t of axial force each. Once in place, the epoxy resin seals the joint together, creating a strong and reliable pipe string. Interchangeable jaws on the press allows it to join pipes with diameters ranging between four-inches to 16 in. The entire process takes less than five minutes, and because of its repeatability it immediately eliminates costly quality, inspection and repair issues which arise from traditional welding operations. The press machine is mounted on to a render table which counters a ship’s motions, should it be used in subsea operations. It’s adaptability to land and see environments means some of the world’s largest pipes can be deployed rapidly, safely and efficiently. Caley constructed the press in 2017 at its Clyde-side manufacturing plant in Renfrew, Scotland. Preparations for shipping are underway, so it can soon commence work on offshore projects in the North Sea, West Africa and the Far East.